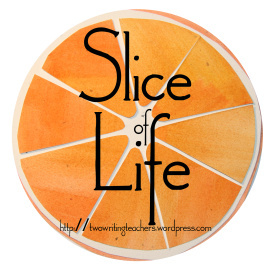 Day 11 in the March Slice of Life Challenge hosted by Tara, Anna, Dana, Stacey, Betsy and Elizabeth at Two Writing Teachers. Read a few more slices here. Today’s slice is all about adventures in informational reading: discovering how students see the text. Vicki Vinton’s recent post on worksheets pushed me to try something today with Scholastic Magazine. My thinking went in this direction: When I ask students to write about their reading it should show me the “process of thinking” and “lead to new thoughts and insight.” Secondly I needed to ask myself will it give me “a window on how students think” so I can take the next step. I gave students a fairly short and simple text from Scholastic News. Students were to read and sketch as they read. Jot words that repeated and ask themselves what is the main idea the author wants you to know/learn from this article? The paper I gave them for response looked like something you might use with primary students, lots of space for jotting and some lines at the bottom. What I found most interesting was what popped out at them. Many thoughtful readers felt that the fact that the young climber was climbing to raise awareness for Duchenne muscular dystrophy (one sentence at the end of the article) was important and added into their thinking. I think this is mostly about how amazing this experience was for him and how he’s trying to get people aware of Duchenne muscular dystrophy. 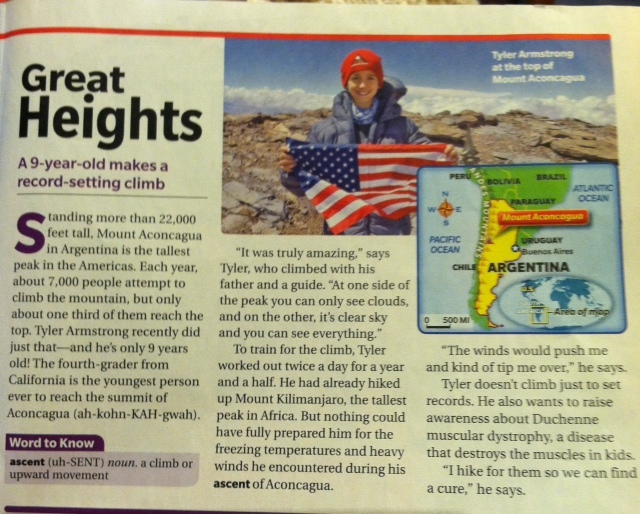 One of my athletic students focused on the training (one sentence in the middle of the article) the 9-year old had to do to make the climb. This is mostly about a young boy who had to train hard to set a record climbing a mountain in South America. Another boy felt it was about reaching your goals. Anybody can reach their goals if they train for it. Kids can do what adults do. It seems many students brought a bit of themselves to the text and it colored their comprehension. All students understood the text, but they all interpreted the meaning through their own lens. You could say they went outside the box of the text a bit, outside the four corners of the page, to place more importance on one aspect of text, making that “fifth corner” discussed in Kate and Maggie B. Roberts post back in September. I asked students to look at their pictures and what they had written. Did the picture and the text match? Was one a better representation of what the article was mostly about? Interestingly the class was spilt. Some said the text matched the picture, others favored their picture over the text, or the the text over the picture. Bottom line, I wanted students to be open to using both strategies when reading and thinking about information text. So what to do with that fifth corner? The part that colored their thinking about the text? We talked about how we bring a bit of ourselves to text. Some things pop out at us more that other things because we have a greater understanding of it or interest in it. And that’s good but we should realize our perspectives and talk with others about how they view the text. What do you think? Did students meet the expectation of (RI 5.2): Determine two or more main ideas of a text and explain how they are supported by key details. Probably not completely, but understanding how they view the text in light of others makes them think a little more about it. This fairly straight forward text became a little complicated once I left the room for their thinking. I’d say they were reading deeply; yet, when you read deeply you cannot help to see things colored by your own experiences and background. I’d say they did (and you did) a great job with that lesson! It is so interesting seeing how their experiences come out. You learn so much about them in the process. Your post reminds me of how conflicted I felt the first time I heard a workshop at TCRWP after the CCSS came out. It was about staying in the 4 corners of the text. Suddenly I felt that using the strategy of making a connection felt wrong and suddenly I was doing this thing called a close read wrong. Your students’ honest responses show that as readers we always have our own lens. I like your idea of helping readers to name their perspective (5th corner) and then to critically think about other perspectives to see the aritcle clearly from the author’s perspective. You have given me lots to ponder. Thanks. I know it is a balance. Check out the post on indent I mentioned. Kate and Maggie (both TCRWP) do a great job in discussing how to manage that 5th corner! Yes, the met RI.5.2! Will you continue to gather more evidence? Yes! And you definitely have evidence of student thinking and should celebrate that their thoughts are not identical. Our thinking is affected by our background knowledge and our own perception of the world around us. Oh yes we continue in our thinking. Actually really enjoying doing just a bit each day. Love your idea of giving them a menu of possibilities and then rating them. Thanks for the comment and the idea. By including more space for their responses, you invited more, too, Julieanne. Sometimes I ask students to think about this sentence: “This piece is about __________________, but it’s really about _________________. Of course we share and discuss the implications of different responses too. Pushing for examples helps too. Thanks for sharing your ideas about this! So fascinating how that fifth corner transformed thir interpretations from macro – the thematic/global “anybody can…” to the more personal interpretation of your athlete. The thinking did get more complicated – and much more rewarding. Bravo! 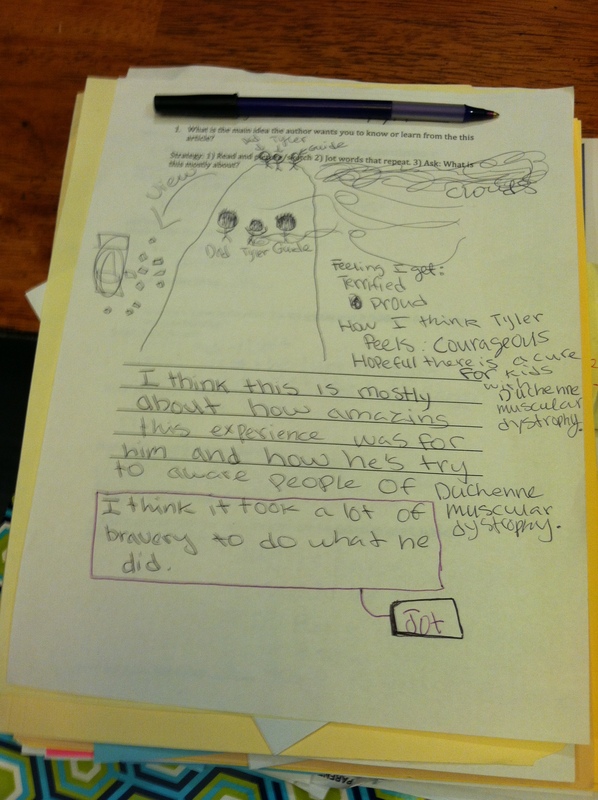 Julieanne, I love that you gave your students space to illustrate their thinking as well as write about it. Your last line, “This fairly straightforward text became a little complicated once I left the room for their thinking” is such an important point! Raising rigor isn’t just about giving kids harder text, it’s about how we ask them to think about it! Nice work! Been meaning to respond to this for a while, Julieanne, so sorry it’s taken me so long. Like Kate, I think it’s absolutely impossible to leave ourselves out of our reading, but we can use what feels important to us to this more about what the writer might want us to understand. Here (or next time you do something like this) I’m wondering what would happen if then kids then attempted to incorporate each other’s thinking into their own—i.e., combine ideas, acknowledging that while you might be attached to your own, your ideas can be enriched by others. It’s a form of synthesis I’ve been experimenting with as well, and interestingly enough it’s brought us into the realm of grammar—i.e., how can you create sentence that add more information through phrases, clauses, compounded structures. I don’t always use those words, but I think letting kids mess around with how you might combine ideas both makes their understanding of the text more nuanced or sophisticated and gives them practice creating sentences whose structure may be outside their usual comfort zone. Let me know what happens if you try it as it’s somewhat new territory for me. Thanks so much for adding on to this in such a big way. The connection to grammar is fascinating. I think that this is what we mean when we tell our students to grow their thinking together, but honestly I haven’t taught in this way. Yesterday we looked at the class developed reasons to support one side of an argument. I purposely collected similar non parallel ideas just to show the trouble so while studied our reasons, we worked to combine like ideas into one reason. I’m definitely pursuing in reading and writing. I’ll keep you updated.